Randy laments the growing entitlement in young people today. His attitude is that kids should be thrilled they got a job in the mailroom, and they should strive to become the best mail sorter there. When Randy asks employers for feedback on his students, the negative feedback is always about new employees being too big for their britches rather than being unqualified. When Randy was 15, he worked as a day laborer hoeing strawberries. Some of his co-workers were teachers, and when Randy made a comment to his dad about the job being beneath them, his dad gave Randy “the tongue-lashing of a lifetime” telling Randy that manual labor is below no one, and he’d prefer Randy to be “the best ditch-digger in the world rather than coasting along as a self-impressed elitist…” Randy still didn’t like the job, but the next day he hoed a little harder. The story about hoeing strawberries epitomizes Randy’s ideas about earning your place in the world rather than being entitled to it. Randy’s dad’s feedback, that nobody is above manual labor, changes Randy’s attitude and behavior immediately: the next day, he hoes harder, feels less entitled, and has more respect for all laborers. Koltun, Moe. 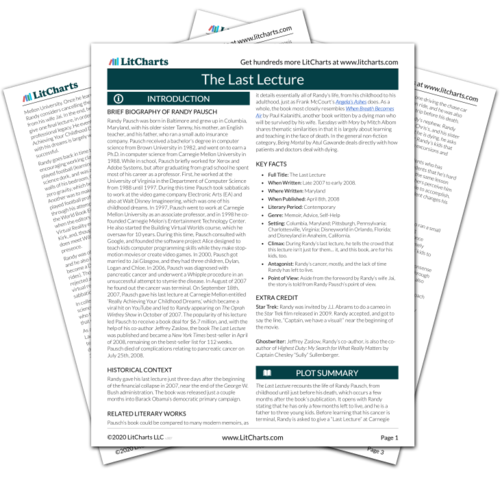 "The Last Lecture Chapter 51: No Job Is Beneath You." LitCharts. LitCharts LLC, 26 Feb 2017. Web. 20 Apr 2019. Koltun, Moe. "The Last Lecture Chapter 51: No Job Is Beneath You." LitCharts LLC, February 26, 2017. Retrieved April 20, 2019. https://www.litcharts.com/lit/the-last-lecture/chapter-51-no-job-is-beneath-you.